This week’s instalment of the #SBIDinspire interior design series features a sky-high commercial property defined by sustainability, energy-saving capability and its modern design. 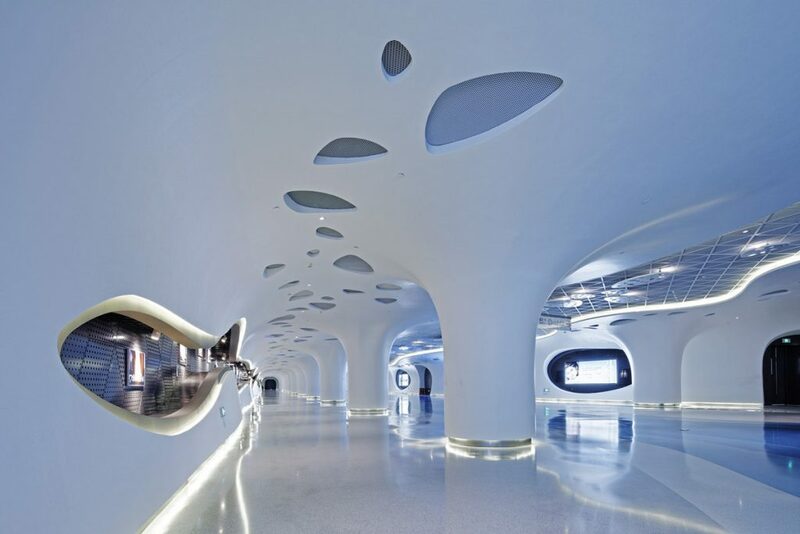 The underground avenue in B2 is about 370 metres long and 15 metres wide and acts as a walkway connecting three skyscrapers. 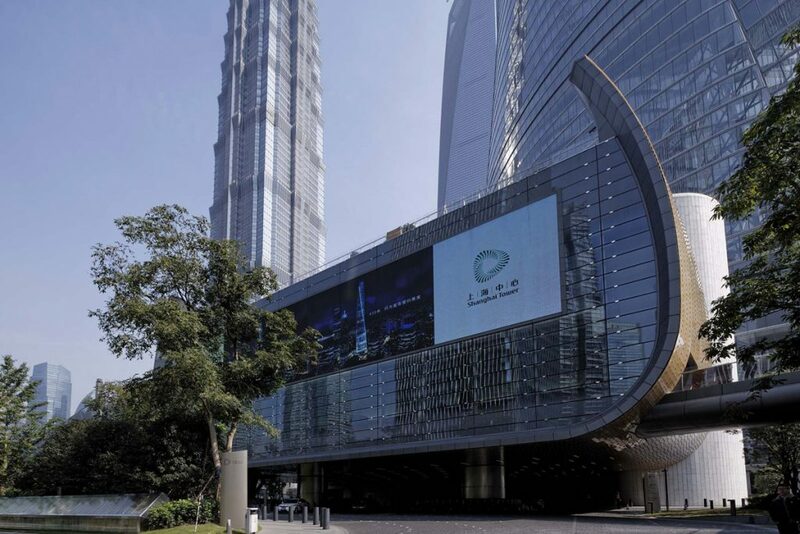 The Shanghai Tower is located on levels 2-5, serving several commercial functions which includes acting as a venue for international conventions, a centre for fashion-related activities, a venue for wedding celebrations as well as an exhibition/show space. The 5th level includes a ballroom seating 500 guests, four multi-function meeting rooms, a business club, a VIP room, a garden bar and an outdoor garden. 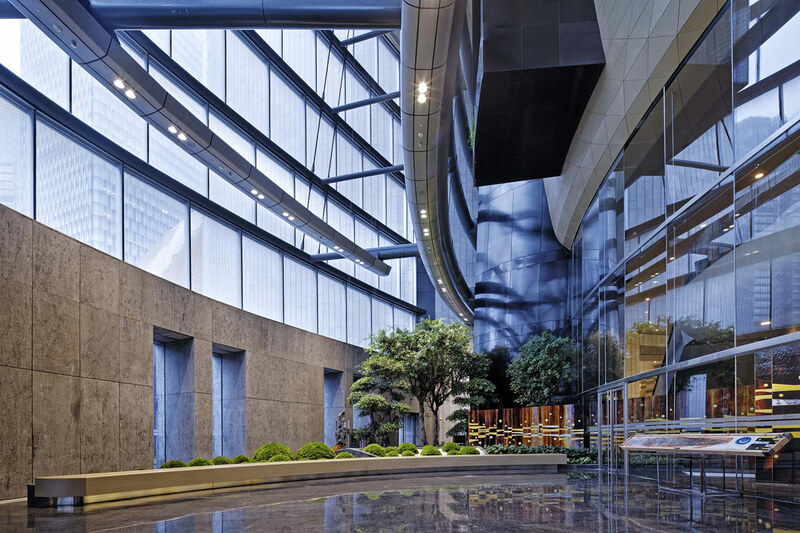 Despite having different functions and appealing to different audiences, the design of this project harmoniously blends culture and business demands while embodying the spirit of the skyscraper: sky-high, incisive and supreme. The owner of Shanghai Tower is Shanghai Tower Construction and Development Co, which is jointly funded by Shanghai Urban Construction Investment and Development Corporation, Shanghai Lujiazui Finance and Trade Zone Development Co, and Shanghai Construction Engineering (Group) Corporation. With the enterprise spirit of ‘passion, harmony, innovation and pragmatism’, the company pursues the construction and development goals of the highest quality, supreme design and precise detail, which integrates multi-party wisdom and resources, and strives to create a concept of humanity and the future with green, sustainable decision-making defining this vertical city. Shanghai Tower is a super high-rise landmark building with outstanding popularity and excellent geographical advantages. Meanwhile, it is also a skyscraper full of cultural atmosphere, using a variety of cultural forms to show the international character of the building. Moreover, the design concept of ‘Nature, Humanity, and Future’ for the building itself is an exciting point to stimulate our project design. With the city of Shanghai being energised by water, the layout of the whole city follows the meander Huangpu River, generating an organic, geographical flow. The culture of the city therefore changed with the city’s layout, giving it containment. 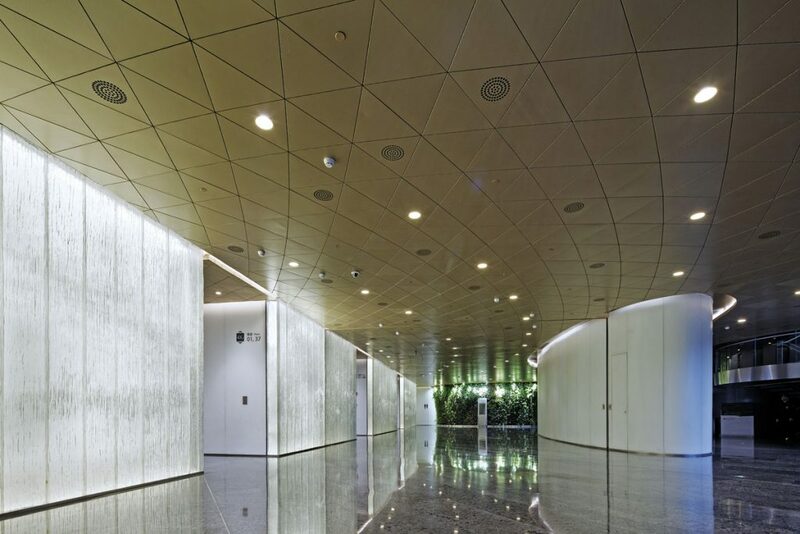 Therefore the main element of the interior design is naturally inspired from Huangpu River: for instance, blue terrazzo flooring which extends gradually in B2 avenue and the blue ripple pattern carpet flooring in ball hall etc. The elements of ‘River’ and ‘water’ are conveyed directly through the design. The interior design also reflects the facade of the architecture: the form of Shanghai Tower is rotating 120 degrees, standing at Lujiazui financial district. The concept of ‘rotation’ is not only showing dynamic form in physics, it also reveals lots of embedded cultural meanings behind the design we implemented; it showcases the continued eternal flow which stands in the sky space overlooking the city. These forms reflect the spirit of architecture as rotation, filament lines, rhythm, and they contribute to the main style of the space. The Shanghai Tower is a complex building with complex functions. Our design needed to overcome many unknown technical problems. 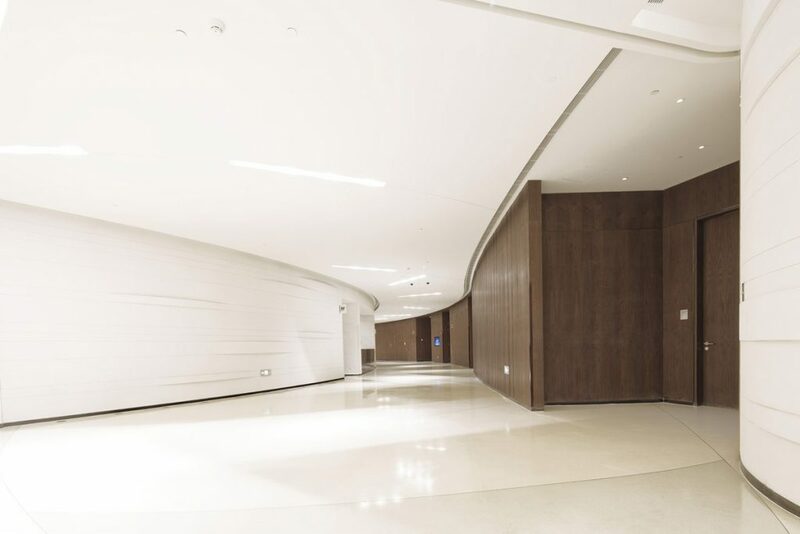 The design area we were involved in uses a large number of curves and shaped modelling, and these modellings must take into account indoor physical space, building structure, electro-mechanical equipment, curtain walls, etc. Therefore, the most difficult obstacle we overcame was the accurate realisation of shaped surface modelling. 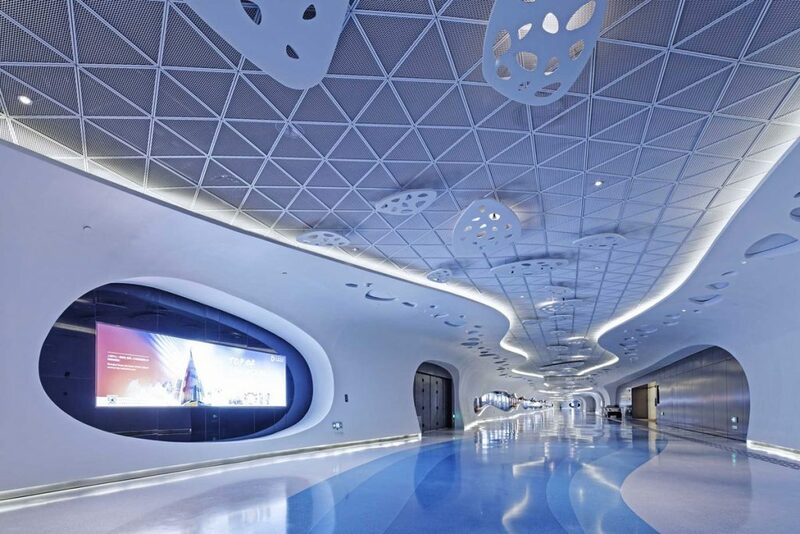 The highlight of this project was that our design concept incorporates regional culture, with the theme of Huangpu River, using dynamic curve modelling: such as the streamlined blue terrazzo splicing ground in the B2 public underground avenue, the rolling wave-shaped aluminium round tube wall of 5F banquet hall, water ripple effect blue carpet of the banquet hall floor and so on. Seeing this fluid, river-inspired concept translated effectively into the psychical design is a great achievement for us. 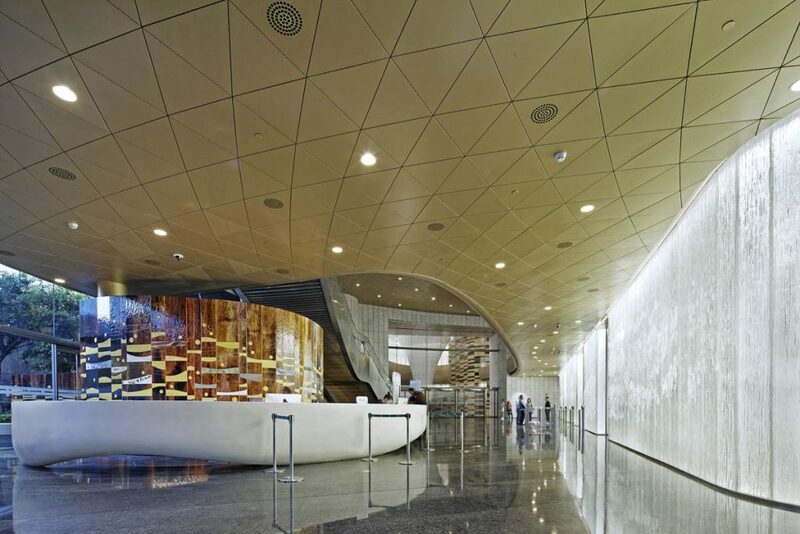 The SBID International Design Awards, with its considerable attention in terms of international awards, have firmly established its position and specifications in the industry as one of the most prestigious design events. Winning the SBID International Design Award would be a great achievement and honour for designers. 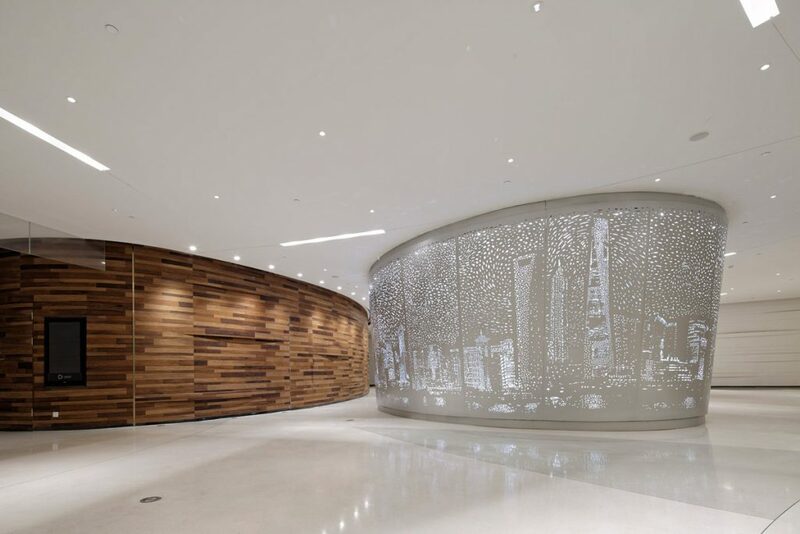 If you missed last week’s Project of the Week featuring a project with complex, architectural elements to create multi-dimensional spaces and structural intricacy, click here to see more.